Opening this afternoon at the Duderstadt Gallery, the /bin/art exhibition showcases student projects developed in Adaptive Art: an interdisciplinary class offered by the School of Art & Design and the College of Engineering. Co-taught by Satinder Baveja (Computer Science & Engineering), director of the University of Michigan's AI laboratory with expertise in machine learning, and Osman Khan (School of Art & Design), an artist who uses technology to create interactive installations, Adaptive Art focused on using computation, algorithms and machine learning as mediums for aesthetic expressions. In this class, computers aren't something that you do your work on - instead, they're a vital part of the finished work, and might even have created it on their own. Working in teams that mixed Engineering and Art & Design students, the class used Arduino microcontrollers and Processing, an open source programming language, to create a wide variety of works that interface with people, whether in the same room or on another continent. Picture this: You're rushing through the Duderstadt on your way to class. As you hurry past the gallery, you're startled by a sudden tapping sound. As you turn toward the source of the tapping, you realize it's being made by an articulated wooden hand - and now it's beckoning, drawing you closer... This isn't the start of a horror story, but an interactive installation: The Beckoner is a wooden hand mannequin that's controlled by software programmed to recognize human figures and faces - when its camera senses a human-sized shape walking by, it taps. If that shape stops and appears to be looking toward the camera, it beckons them in. "The Beckoner is study into the dynamics of human-computer interaction in a public space – can a wooden hand really engage the attention of the busy students and faculty walking by the gallery?" In today's world of TSA body scanners and cameras at every store entrance and traffic light, it's hard to know when you're being watched. Monitor plays into this modern paranoia: As a viewer steps into the installation, he's surrounded by 3 pillars, each topped with a TV monitor. The center TV displays a security camera feed of the subject, and the other two display closeup footage of human eyes. As the subject turns toward any of the monitors, facial recognition software notices - and switches that monitor to static. The result? "The subject will only be able to see video in his periphery, adding to the sensation that he is being watched. The room reacts to the subjects actions in a way that is meant to maintain his ignorance of the content being displayed. " This installation takes a new approach to the traditional sampler, "focusing on transforming how we treat audio and sound, from being audible and intangible, and translating it into a physical object that can be moved, contained, and mixed together." Users can speak into the red/blue pitcher, then play back the sound by pouring it into the green/yellow one. Sound can be sloshed back and forth between the vessels to mix, and dumped on the floor to erase. Hands Free Super Three: presenting three classic video games played hands free (sans controller)! Music Sequencer: a self-contained, 8-bit, Arduino-powered music sequencer. Sounds are selected and sequenced using an array of buttons on the main panel. Read more about all of the projects at the Adaptive Art blog. To get the full impact of these interactive installations, you should really see them in person, but there's a limited time to check them out: /bin/art opens with a reception at the Duderstadt Gallery from 4 - 6 pm on Thursday, December 16 and closes on Friday, December 17th. A&D professor Heidi Kumao researches time-based work for her two courses: "Tools, Materials, Processes: Time" and "Animation for Broadcast." One of my favorite pet subjects: Data Visualization! And now Geoff McGee has made a nice documentary about it and journalism. This from the incredible website: Information Aesthetics. We are increasingly surrounded by and are drowning in mountains and mountains of data which would necessitate having artists and designers on board for any project involving data, no? SOMEONE needs to make the data coherent and give it a visible/physical representation, no? Emilia is an MFA candidate, performance/theater artist, object maker, puppeteer, interpretive dancer, writer, budding video artist and creator of imaginary realities. As my first post on the PLAY gallery blog, I thought I'd share one of my newest obsessions: the films of Jan Svankmajer. Many years ago (as in, perhaps, 2001) I had the pleasure of watching one of Jan's more recent feature films, 'Little Otik', which he made in 2000. The film tells the story of a childless couple who end up adopting a tree root that vaguely resembles a child. Through pampering, the tree root slowly comes to life, growing and growing until horror ensues as he begins consuming anything and everything around him. A truly strange, surreal, amazing film. Highly recommended. At the time I watched it, I forgot the name of the film and who it was by, and only recently rediscovered it again. Well, it turns out that 'Little Otik' is just one of many films by Jan Svankmajer that are more than just amusing. Born in Prague in 1934, where he still lives today, Jan Svankmajer attended the Institute of Applied Arts and later the Prague Academy of Performing Arts (Department of Puppetry). His career led him through involvement with the Theatre of Masks and Black Theatre, and later Laterna Magika Puppet Theatre, where he began working with film. Jan's films incorporate elements of animation and puppetry to create surreal, grotesque, gothic tales full of surprise and wonder, touching on the very absurdities of human existence. Instead of me twisting my own words into a knot trying to describe the films, go ahead and see them yourself, if you haven't done so already! I've attached a favorite of mine, 'Food, Part 1&2', to this posting. You can find more on youtube and on his website: http://www.jansvankmajer.com. mr steve gets sick. hollywood makes him worse. Stephen Schudlich is the Director of Exhibitions for Work • Detroit, A&D's exhibition space in the 313.
this week, i got sick. really sick. then my wife got sick. really sicker. not a good week. while down and out, drinking Vernor's which, by the way, is straight up full on medicinal in these parts and if you don't know you better "aks" somebody. anyway, i watched the worst movie ever made, They Live, starring former wrestling curiousity "Rowdy" Roddy Piper. i am not going to describe this film to you. rent it, buy it, steal it and then watch in horror. only good part is the epic fight scene which i have linked you up to here. enjoy. i still don't feel well and have IP set up this week which may or may not inspire future blog entries. possibly venom laced. if the thought of this bothers you, please refer to mr. steve profile description. it may not always be pretty and, it most definitely ain't all good. Definitely not for kids, this commercial is HILARIOUS. I cited it as an inspiration for my IP project last year, and just discovered the outtakes. Day 2 of Sonic Acts 2010: The Poetics of Space started off with the beginning of the conference proper, meeting up at the massive Café De Balie in the Leidseplein entertainment district of Amsterdam. 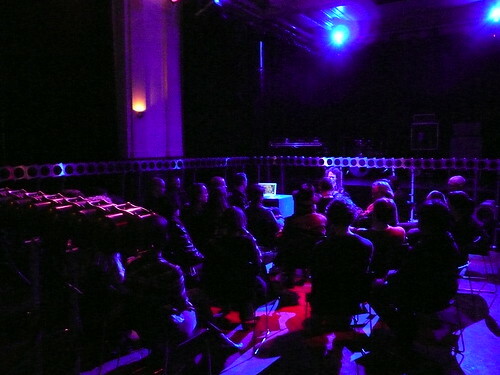 De Balie seemed enormous, with its multiple rooms of café seating, a full bar, ticket office and two theater spaces on the ground floor alone; that was until the crowd for Sonic Acts decided to show up. There were so many people, the atrium and café were shoulder-to-shoulder by 9:45am, fifteen minutes before the conference was scheduled to begin. Luckily I'd pre-ordered a festival and concert pass before I arrived, so I was one of the lucky ticket holders who had priority to sit in the theater where the conference was actually taking place; dozens of other people weren't so lucky, and were banished to the secondary theater to watch what was happening in the theater across the hall on a live internet stream. Keep in mind, this was an academic conference on sound art...I can't reiterate enough, the interest in sound art I witnessed in Amsterdam was truly unprecedented. I've never felt hipper wearing glasses, being bald, and carrying around a Zoom H2 than I did for those four days in Amsterdam. 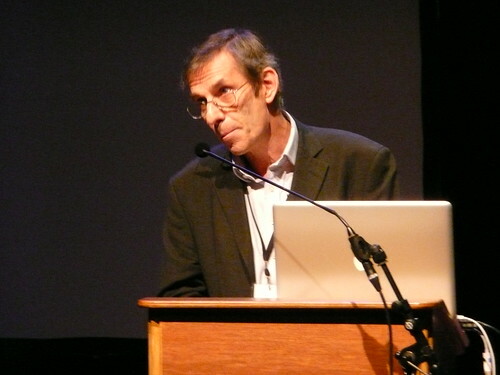 The keynote speaker was Derrick de Kerckhove, a collaborator of Marshall McLuhan's who spoke about the 21st century's move past traditional renaissance perspectival representation into a post-visual, tactile perspectival realm dominated by the advent of electricity, with the "point of being" replacing the "point of view" as the commonly accepted referent to one's position in space. Daniel Terrugi, Director of the Groupe de Recherches Musicales, and Raviv Ganchrow, a sonology expert and installation artist, comprised the speakers for the second session, Architectures of Sound. Terrugi discussed the positioning of sound sources in space (ie surround sound systems) and their impact on contemporary musical composition, while Ganchrow discussed his work with wave field synthesis in order to redefine acoustic spaces. Ganchrow's wave field synthesis system, a 192-channel surround sound system, was on the schedule to appear at the concerts in the Paradiso club the night after his speech, something I was really looking forward to experiencing. Christopher Salter was the highlight of the Exercises in Immersion panel. His lecture, "The Question of Thresholds: Immersion, Absorption and Dissolution in Cross-modal Environments" was fascinating, covering James Turell and Robert Irwin's 1968 of the effects on consciousness of extreme sensory input reduction -- basically an analysis of the effects of minimalist art on the audience's consciousness. I was really interested in his discussion of enactive cognition (how our environment arises out of the loop between action and perception) and enactive perception (how perception is achieved because of our bodies' sensorimotor system, and all perception equals action). Salter's new book, Entangled: Technology and the Transformation of Performance is definitely on my to read list. A panel on Utopian Spectacles was up next, with Branden W. Joseph (author of Beyond the Dream Syndicate: Tony Conrad and the Arts after Cage) and Trace Reddell (Director of Digital Media Studies at the University of Denver) gave presentations about John Cage and Lejaren Hiller's HPSCHD and the Vortex concerts of Henry Jacobs and Jordan Belson. Renowned theater artist Robert Whitman was up next, discussing his use of space in non-traditional theatrical venues (see the above video), as well as debunking some myths about the legendary 1966 performance event Nine Evenings: Theatre & Engineering he participated in along with John Cage, Robert Rauschenberg, David Tudor, Yvonne Rainer, and Deborah Hay among others. The final panel of the day, The Poetics of Hybrid Space, featured Eric Kluitenberg (head of the media program at De Balie, the conference's venue; Duncan Speakman, a locative media artist who premiered a new guided soundwalk which took place immediately after the panel; Peter Westenberg, a visual artist who specializes in open source practices; Elizabeth Sikiaridi, a professor of urban landscape design at the University of Duisberg-Essen who spoke about the breakdown of Cartesian space as the ruling system of perspective and its replacement by the speed of electricity's power to control the rate at which we experience space; and Karen Lancel and Hermen Maat, Dutch artists who presented their wearable art project Tele_Trust via webcam from Vancouver. But that's not all...there were five more hours of concerts to go to. The theme of the second night of performances was Expanded Space, and the bill focused heavily on experimental cinema. Laszlo Moholy-Nagy's only abstract film, Lichtspiel Schwarz-Weiß-Grau from 1930 was up first. Projected on film rather than video, this was as close as we were going to get to experiencing the piece as it was originally presented; not to mention that beginning a five hour stretch of concerts with a six minute silent film from 1930 was a bold move, and the audience continued to amaze me by attentively (and silently) watching while crushed shoulder to shoulder in a standing-room-only crowd. Gill Eatherley's three channel film Hand Grenade (featuring a soundtrack by legendary Krautrock band Neu!) was a definite highlight. Again projected on film, this abstract work was made in 1971 with a series of still images of light drawings which were extended, looped and altered via painstaking optical printing. A performance entitled (SHIFT) by Dutch duo Optical Machines featured live sound and mesmerizing video generated via a series of mechanical devices and metal plates being filmed and processed in real time.